Space shuttle Endeavour safely blasted off from Kennedy Space Center this evening, delivering extra living space for the International Space Station and the promise of cold, refreshing recycled urine on tap. As part of their 15-day mission, the astronauts will deliver two new sleeping units, a kitchenette, exercise equipment, and the much-need relief of a second toilet. NASA's plans are to double ISS crew size from three to six as early as May. Endeavour awaits lift-off. Image courtesy of NASA . The shuttle also brings a $250m wastewater recycling kit designed to purify urine and evaporated perspiration into clean drinking water. "We did a blind taste test of the water," said NASA's Bob Bagdigian, the system's lead engineer told the BBC . "Nobody had any strong objections. Other than a faint taste of iodine, it is just as refreshing as any other kind of water." "I've got some in my fridge," he added. "It tastes just fine." The water recycling equipment can process a full day's wastewater in less than 24 hours. With only 10 more scheduled flights before the shuttle fleet is retired in 2010, the space agency wants to lighten the load of drinking water needed to be hauled up to the station in future launches. 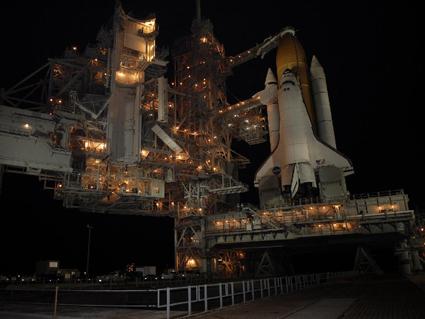 The mission, STS-126, has been dubbed "Extreme Home Improvements." In addition to installing the new quarters and equipment, it has four space walks on the agenda aimed at services the joints that rotate the ISS's solar arrays. 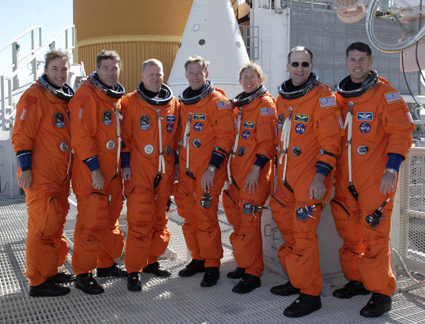 Aboard Endeavour (from left to right) is mission specialists Heidemarie Stefanyshyn-Piper and Steve Bowen, pilot Eric Boe, mission commander Chris Ferguson, and mission specialists Sandra Magnus, Donald Pettit, and Shane Kimbrough.